Last week on the Poetry Chain, Brian Culhane was roundly loved (except for one poor caps-lock-plagued guy who insisted that we need to get a Portland poet involved in the Seattle Poetry Chain). Today, and I must note without my urging, Culhane has chosen Kim-An Lieberman to be the next poet on the Seattle Poetry Chain. 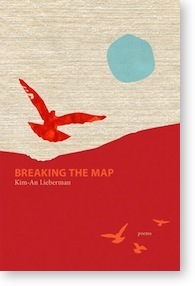 Kim-An Lieberman has a new book out: Breaking the Map. She's a poet with a particular interest in Vietnam, though that's like saying Elizabeth Bishop had a particular interest in Brazil: it's accurate enough to say but misses the wondrous quality of the connection. Kim-An's work touches on the mythic and magical, often meshing the extraordinary with the quotidian: how to name one's child; how to listen to a song for the second time; or what to do on a school choir trip to Juneau. She has depth and originality and a lovely lyrical ear. If you'd like to learn more about Kim-An Lieberman, her website is here. The poem that Lieberman would like to share with us will appear in the upcoming 13th volume of the Jack Straw Writers Anthology, and she'll be reading with Jack Straw on May 21st. Without further ado, here is Kim-An Lieberman's poem for the Seattle Poetry Chain. Here’s the headline: Marmaduke runs amok. down the block, anointing the world with slobber. Heathcliff wonders if the milkman will ever return. B.C. and Dagwood toast to syndicated oblivion. as the blue globe spins its last late-breaking round. then it’s just a caption for someone else’s copy desk. Any poem that works in Marmaduke is more than all right with me! 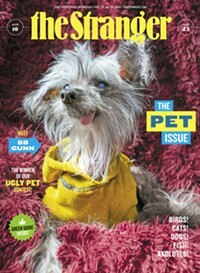 Many thanks to Brian Culhane for his great choice, and thanks to Kim-An Lieberman for participating. Tune in next week to see who she chooses as the next link in the Seattle Poetry Chain.